Inspiration at the Farmers' Market! One Sunday Natalia and I roamed the Logan Square Farmers' Market which offers specialty produce and artisanal products, and some food vendors tacos under the tall trees on the greenway lining Logan Boulevard. 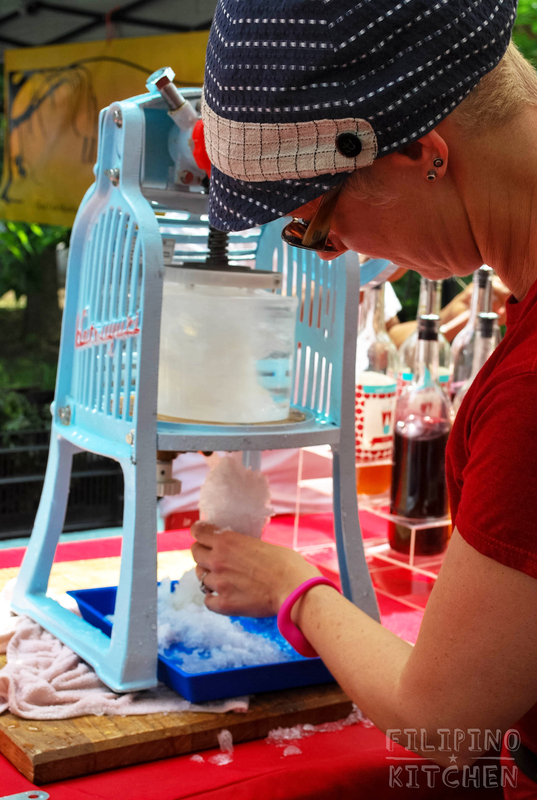 We noticed our friends at Jo Snow, a maker of custom syrups perfect for cocktails, coffee and sodas, offered a Taiwanese shave ice dessert among the offerings of custom sodas and snow cones. Melissa, proprietress of Jo Snow, explained the inspiration -- her husband is Taiwanese. But only one thing was on our minds as we laid our eyes upon this awesome hand-crank ice shaver: HALO-HALO. Other ice creams like avocado or mais con queso (corn and cheese!) as in Sunda's version at right. Their version even used calamansi (small citrus close to lime native to the Philippines) grenadine. I love sour things and it perfectly counter-balanced the sweet richness. Game-frickin'-changer. The absolute key to the best halo-halo -- no matter what you include as the supporting cast of ingredients -- is the freshly shaved ice. If the ice is shaved to order (just before it is to be served and eaten), the ice remains soft like snow. When mixed-mixed with the other ingredients, everything chills out into a slurry of multicolored awesomeness. It's a secret in plain sight. But sadly it's one secret that many a Filipino joint has horribly overlooked. On the other hand, if the ice is shaved and then allowed to sit in a refrigerator awhile, it will soon revert back into a solid ball. It's a great disservice that many a Filipino food establishment purportedly hawks halo-halo, only to actually bring customers a re-coagulated iceball, impenetrable to dinted spoons and unable to be mixed with the other rich ingredients. At that point, I carefully remove the ice ball and eat the rest of the shaved ice-less dessert. Like mounds of sushi rice left uneaten on the plate without its fish, this defeats the whole purpose of halo-halo if you ask me. A halo-halo is a terrible thing to waste. Should you take the time to gather or to cook from scratch the necessary components of and implements for a halo-halo, please, I beseech you -- shave the damn ice on the spot. A layer of plantains and caramelized sugar, with a few spoonfuls of said sugar. Scoops of freshly shaved ice! We haven't written the proportions here because you can make it what you like. And it depends on the size of the glass you have. There's really no wrong order, except it's helpful to have the ice toward the bottom and pour the condensed milk on top to pat it down. As a final suggestion, it's nice to have the colorful ingredients on top. 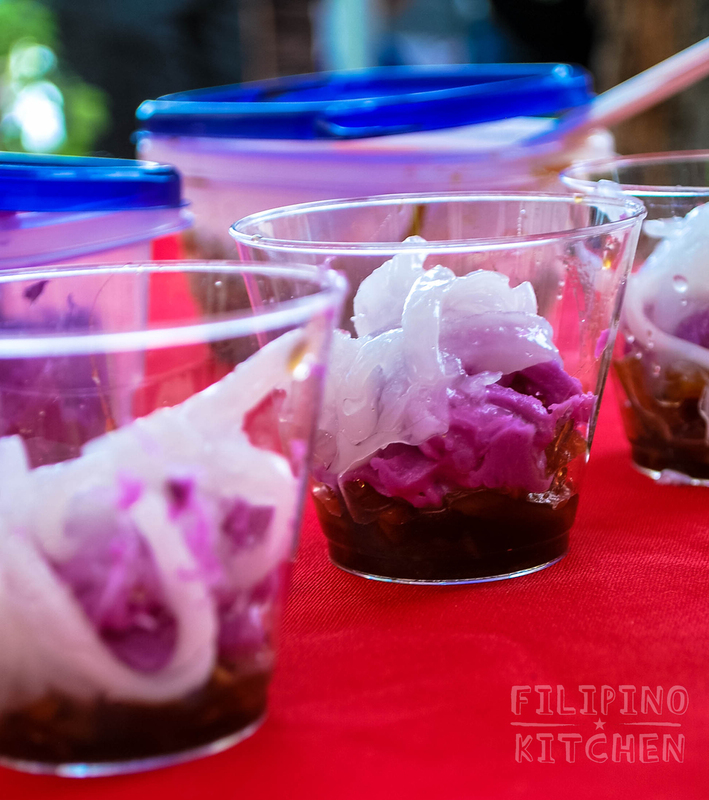 We like the frozen ube by Tastee because the desired halaya consistency is easy to render. The halaya should hold together well and come away from the sides of the pot as you stir it. It's easy to find in your local Filipino or Asian grocery store. Pinch of salt. Dat's it. As true to its name, dump all ingredients into a pot and stir, stir, stir until well combined. Again the consistency you want to achieve is like a thick oatmeal that sticks to a spoon when turned upside down. Challenge yourself not to eat this purple goodness straight out of the pot. Difficulty high. But hey, if you want to find fresh ube or purple yam and cook and mash that yourself, go all out, man. And send us pictures! LECHE FLAN inspired by Panlasang Pinoy. It is a hot one! We've replicated this leche flan recipe (a few tweaks are noted) with permission from our friends at Panlasang Pinoy! Salamat po sa inyo! 1 cup of sugar. Brown sugar can be used but it's harder to tell when it's fully caramelized since it's already brown. You can tell by the smell :) or so says my mother. Llanera, a shallow aluminum pan, either oval or round shaped. Steamer. Natalia's steamer made this a lot easier. You can also make a water bath, too. Bring a good amount of water in the steamer to a rolling boil. Put the lid on. Mix the egg yolks, vanilla, condensed and evaporated milk. Add lemon zest and a squeeze of lemon juice. Pour the custard mix through a strainer to remove the zest or any egg membranes or chalaza from the custard. 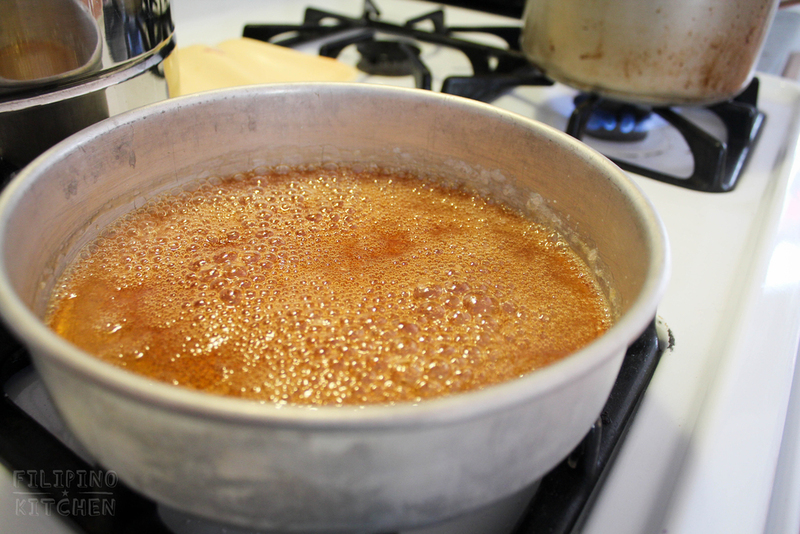 For the caramel, put the llanera right on the stovetop, use medium high heat. Add the sugar and the water. This is very important: Don't use a spoon to mix. Instead, carefully hold the warm llanera pan and swish around the water and sugar until they fully combine. Replace the llanera on the heat and watch the sugar mixture until it turns amber. If the amber coloring is uneven, again carefully hold the pan and swish around the sugar-water mix. Once the sugar mix turns amber, swish the pan around to coat the sides. Take the pan off the heat to cool for five minutes. Then slowly pour the custard mix into the llanera. Into the steamer of rolling boiling water goes the llanera for 30 minutes. Place the lid on the steamer, please! Should you have any doubts about whether the custard is fully cooked, use a toothpick to test the consistency... which should be firm and not runny whatsoever. The real test is coming next. Remove the llanera from the steamer and place a plate over it like a lid. Then quickly, holding the llanera and plate together securely, flip them over so that the plate is now on the bottom. The moment of truth: pull the llanera off the plate. The flan should hold its shape and stand, and the caramelized sugar will run down the sides of it. Assemble the Halo-halo... Final step: Mix, mix, EAT! What do you like in your halo-halo? Where's your local go-to place for halo-halo? Let us know in the comments! Thank you for reading -- maraming salamat po!